Operating since 1993, Line 1 was the first underground mass transportation line in Shanghai. You can easily identify the route by the red colored tracks on subway maps. 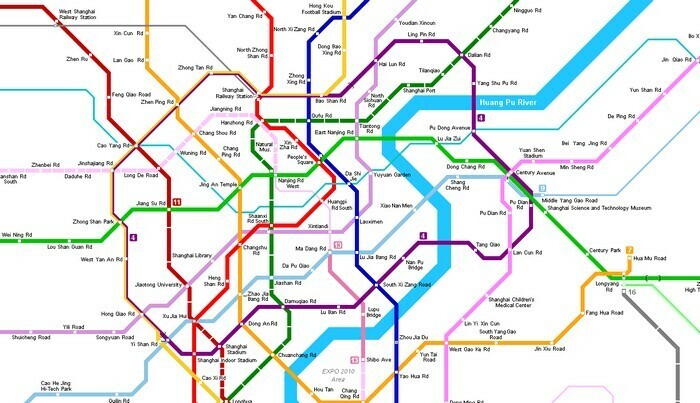 The line runs from Jinjiang Park to Xujiahui and is by far the busiest and most important subway system in the city. Running from north to south, it links the Bashan District in the north to the Minhang District in the south. It stretches almost 40 kilometers and has 28 stations at many of Shanghai’s best-known tourist attractions. Line 1 stops at sites such as Jinjiang Park, Shanghai Indoor Stadium, People’s Square, the Shanghai Railway Station and Circus World. Because it intersects many of the larger railway stations, Line 1 enables riders to continue their trip further outside of the Shanghai city limits. The line is split up into four sections, two in the south and two in the north. Transfers to various other lines are available all up and down Line 1. Transfer to Line 7 at Changshu Rd. Transfer to Line 10 at South Shaanxi Rd.